Yesterday morning had a sense of ‘back to reality’ for many people, who woke up to an overcast, drizzly start to the day for the first time in weeks, coupled with the realisation that England had gone out of the World Cup, albeit a bit later than they usually do. For the team at Engage Web though, we were hoping to prolong the Escapism for at least another day. 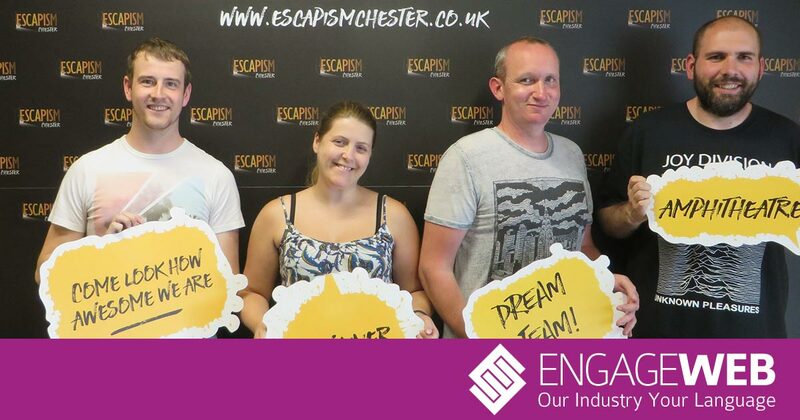 For our Team Building Day this year, we had signed up to take on two of the rooms at Escapism Chester. As we had done so well at Escape Room in Manchester two years ago, we decided to go headlong into the two most challenging rooms there – the brand new Legacy room and Amphitheatre, the Roman theme of which is right at home in Chester. We started off as all big days should – with a pub breakfast. The Hungry Horse on the Coliseum Shopping Park was the scene of the first outrage of the day, when it was revealed that I am having a meat-free week. This immediately threatened to upset the chemistry of our small but highly efficient team, although Darren soon forgot about it once he’d got a couple of sausages down him. Then we went from breakfast to (hopefully!) breakout, as we made the short trip to Chester to face our first test of the day. If you’re unfamiliar with the concept of these escape room challenges, they put you in a situation where you’re in a small room and you have a set amount of time to get out. To do this, you have to conquer several cryptic, mind-bending puzzles, and be able to operate padlocks – often, the people best at cracking the codes are not the best at actually inputting them! Without giving anything away that isn’t on the Escapism Chester website, the story behind the five-tombstone rated Legacy is that you are an heir to a wealthy but somewhat uncooperative distant relative who has insisted on being buried with her valuable jewels. Overcoming a series of challenges will allow you to seize the possessions, but you need to do so before the crypt keeper returns and imprisons you. After the inevitable pre-Escapism tomfoolery, we discovered that this room is gravely difficult! Did we make it out? Well, we were literally down to the last clue – another minute or two and I’m sure we would have done it – but we were just beaten by the keeper who locked us in. Somehow, though, we managed to negotiate an escape to the nearby Pied Bull for lunch. With the help of some brain-food (veggie again for me, of course), we would hopefully have plenty of appetite for our second challenge. The excellent house Double IPA was probably not the wisest choice of lunchtime tipple at 7.2%, but with Lianne and Alan staying on the soft drinks, we would perhaps have a nice blend of sober practicality and tipsy bravado that would see us through what was billed as an equally difficult room in Amphitheatre. The room may well have been just as tough, but I felt like we were now working better as a team and communicating more effectively. We weren’t afraid to split up into groups of two, whereas in the first room there were perhaps times when we all crowded around the same puzzle. With so much to look at in the rooms, it can be hard to know where to start, so it makes sense to split up and maximise your collective analytical skills. Whatever we did, it worked, and we were out of Amphitheatre with almost 15 minutes to spare. I really enjoyed Escapism. In particular, I thought the on-screen clues were a nice touch, and helped to maintain the realism of the challenges a little better than having staff coming into the room to assist you as was the case in Manchester, although we should acknowledge that this was two years ago and these escapology tests are developing very quickly. In terms of team building, it reminded us again of what we all bring to our roles. In a situation like Escapism, you need bosses (Lianne), you need people who can work quietly and independently (Alan, who solved the final clue without even telling us! ), you need technical minds (Darren) and you need literal-minded boffins like me who read carefully and spot patterns. There’s no right or wrong way to be, but it’s about combining and understanding each other’s skills to reach a goal collectively. If we can do that, we have escapology powers that would make the great Houdini look like one of the Chuckle Brothers.